Our leading design and manufacturing facility enables us to supply the event and leisure industry with top quality interiors to transform a space into a beautiful venue. 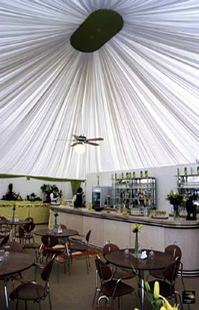 Whether that space is in a marquee, village hall, sports hall or other building we have the solutions. We have thousands of square metres of fabric linings for hire or sale of all colours and styles. We also offer a bespoke service, printed linings including Asian prints and much more. We are conveniently placed in Banbury, Oxfordshire and adjacent to the M40 corridor. With easy access to the M6,M1 and M69 interchange, our same day service reaches most parts of the UK.
" I would like to say thank you to you and your team at Leisure Interiors, you really pulled it out of the hat for use at short notice, we were delighted with the work you did for us and in the manner it was carried out."